Daily Debate: Did Operation Moonfall Matter? Immediately following the official announcement of Majora’s Mask 3D, long-time supporters of a Majora’s Mask remake went through a flurry of thoughts, emotions, and questions; some wanted to know for how long this game had been gestating, others were simply and shock, but nearly all were elated. Not the least of these fans were the ardent supporters of the Operation Moonfall movement. For those who are unaware of this movement, know that it was a fan-based movement started back in 2011 in an effort to get a remake of Majora’s Mask on the 3DS, much in the same way that Ocarina of Time received one. Following last week’s news, some supporters were quick to assume that Operation Moonfall did have a significant impact on the decision to create the game; Nintendo was certainly aware of the movement. And yet, a statement by Eiji Aonuma a few days ago made it clear that the decision that to develop the remake was made well before Operation Moonfall reached its prime. So is that the end of the story? Does the fact the Majora’s Mask 3D was in development the whole time OM was in process mean that it didn’t matter? Many fans have made it clear that they believe so, pointing out the obvious conclusion and gloating about it to their OM-supporting peers, and with fair reason. Some OM supporters undoubtedly are going (or have already gone ) through an identity crisis of sorts, uncertain of whether or not the movement was in vain. This, however, should not be over-dramatized; Operation Moonfall’s main supports ended over a year ago and for many it was simply a signature on a petition and a hope for a game. For the founders of the movement, such as our own Nathaniel Rumphol-Janc, this should be a rather large and crushing blow – and yet it isn’t. Like most all in the fan community, the leaders of the Operation Moonfall movement are simply thrilled that this wasn’t all just a pipe dream; Majora’s Mask 3D is actually happening. And they are looking forward to playing it just as much as everyone else – not to mention sharing any and all news they learn about it. As one who was never part of Operation Moonfall – although I was certainly aware of it – I am happy that the movement existed. Although it is far too early to tell whether the movement pushed development ideas or was purposely utilized by Nintendo to aid marketing for the game (the latter of which we will likely never uncover), one thing was made clear: the Zelda community and its fans are strong and supportive. From kickstarters, to art, to the main petition, it became clear just how important incredible series can be to people, and that alone is worth celebrating. Never having played the original, I am thrilled to finally have my curiosity surrounding Majora’s Mask sated this coming Spring, perhaps sooner if I sit down and take the time to play through the N64 version. 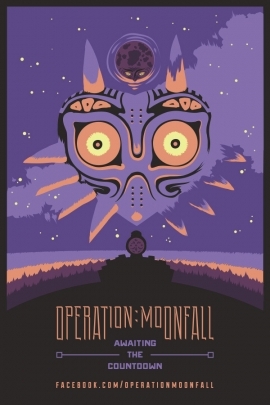 And I thank Operation Moonfall for drawing me further into the Zelda fandom, making me question this unusual title, and eventually leading me to write and collect news for the series I love. So here I ask you, those who supported OM, those who laughed at it, and those who simply knew about it in passing: Did Operation Moonfall Matter?